March is the month that we honor Women of Wilson. 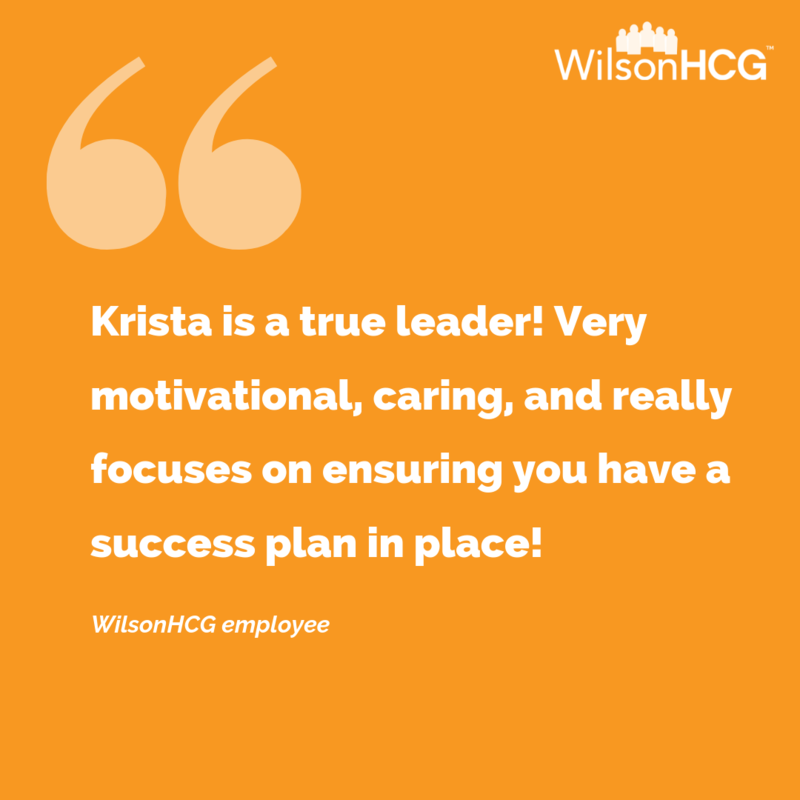 This initiative is designed to recognize and thank the women who are innovating, leading by example and contributing to the success we’re experiencing here at WilsonHCG. Krista Connell, an Account Director at WilsonHCG, is our first finalist. She is based in Corcord, New Hampshire. It will be four years on June 1st. I would be an elephant. They have a very close-knit family bond and similar to humans, when a herd member has been absent or fallen behind, the herd shows great emotion when reconnected. They also show empathy, are attentive and are incredibly smart. The top item on my bucket list is to attend an MLB game in every stadium, preferably when the the Red Sox (my team) are playing! I would LOVE to be a morning person and I am trying, but truth be told I am a night person through and through. If I could trade lives with anyone for a day, it would be Queen Elizabeth II. Have you seen The Crown?! She has a deep sense of civic duty, is stoic, modest and capable. Her gender has always been irrelevant to her capacity to do her job. I would love to trade lives with her for a day to sift through the red box, wear one of her amazing outfits, speak with world leaders and dignitaries, dine on incredible food, and travel to far away places. A woman in history that I really admire is Dr. Maya Angelou. Maya Angelou is the author of one of my favorite books, “I Know Why the Caged Bird Sings”. It was a coming-of-age story that illustrated how the strength of her character and a love of literature helped her overcome racism and trauma. She was an American poet, singer, and civil rights activist. She is also the author of one of my favorite poems, “Still I Rise”. What advice would you give to someone looking to advance into a leadership role? Always do your best work; you never know who is watching (Integrity). Set goals. You cannot just want it - you have to work for it. YOU must be the agent (Ownership). Find a trusted adviser and ask to be mentored at every step of your career. As you learn and grow, be sure you’re sharing your knowledge (Collaboration). Your most challenging relationships (be it clients, employees, friends or family) are an invitation for personal growth - embrace them (Communication). Finally, trust, believe in, and enjoy the journey in getting there (Passion). 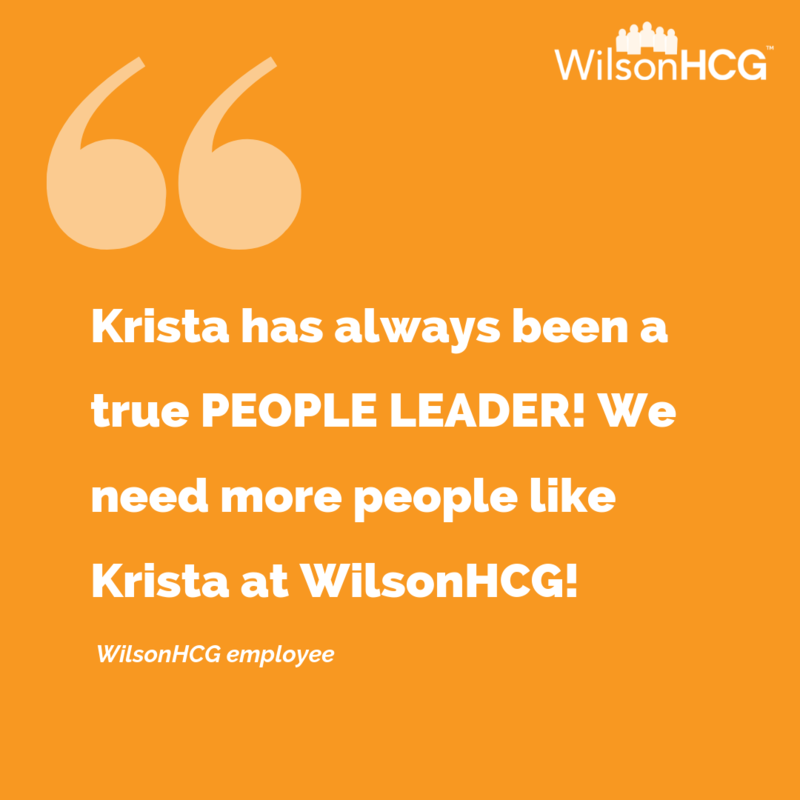 Krista Connell is an Account Director at WilsonHCG, and has over a decade of sales recruiting experience. She is the Co-Committee Chair of WilsonHCG Operation Transition Committee, and in her spare time volunteers as a Career Counselor for Hire Heroes USA, both of which empowers U.S. military members, veterans and spouses to succeed in the civilian workforce.